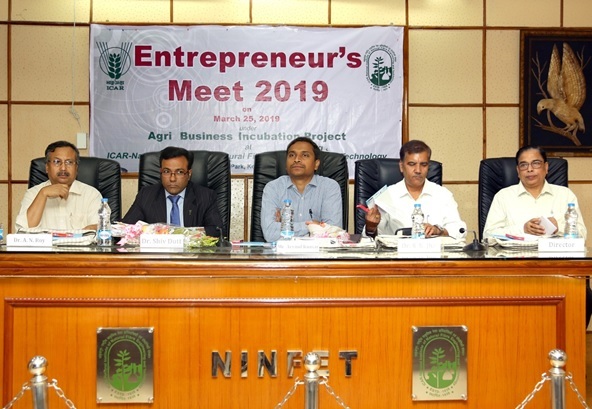 ICAR-NINFET has organized an Agri-Entrepreneur’s Meet 2019 held on 25.03.2019 at ICAR-NINFET Auditorium. The programme was intended to explore the possibilities of expansion of the business ventures by the young energetic entrepreneurs, especially who have received the training from NINFET earlier. Shri. Arvind Kumar,IAS, Secretary, National Jute Board, graced the chair of Chief Guest and Dr. S. N. Jha, ADG(PE), ICAR was the Special Guest of the Programme. Besides that, Dr. Shiv Dutt, PS, IP&TM, ICAR. 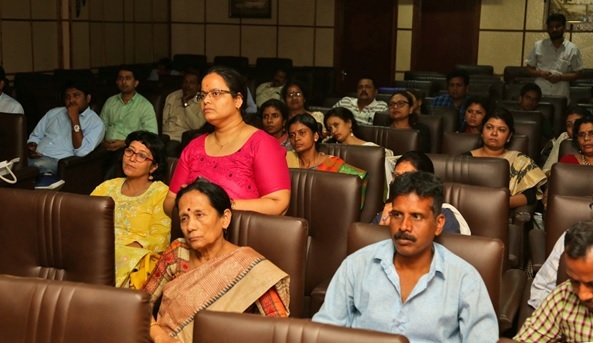 Dr. Mahadeb Datta, Deputy Director, (Technical) were also present in the programme. 20 entrepreneurs, 18 incubatees and start-ups along with the Scientists of the Institute, attended the programme and interacted with the speakers with relevant points. Dr. N. C. Pan, Director, ICAR-NINFET welcomed the august participants very warmheartedly. He addressed to the participants regarding the importance of this types of programme. In the Introductory Speech, Dr. A. N. Roy, In-Charge, ITMU and PI, ABI and Head, TOT Division, stated about the main intention of such programme, which was to create a platform to all the stakeholders to come together and exchange their need and solutions. Dr. Shiv Dutt informed that the basic objective of the Department of IP&TM was to help the Entrepreneurs in various ways, such as through suitable technology supply to finance support system creation etc. Dr. S. N. Jha addressed to the audience by encouraging new innovations for their products. He emphasized about creating brand identity and novel products for the consumers which will fetch high value in near future. Shri. Arvind Kumar described about the different Schemes and facilities NJB offering for the Start ups and stand ups. He shared some novel ideas by which new entrepreneurs can start their venture in near future. In technical Session, Shri Rajsrshi Maji, Assistant Director, MSME Development Institute, elaborately described about the schemes and projects of their department. Shri. Prasant Dubey, Assistant General Manager, NABARD, also stated about the vision and policies of NABARD. Sri. Sudipta Saha, Joint Director, Directorate of Micro, Small and Medium Enterprises and Sri. Dhurjati Prasad Bose, Assistant Director, Directorate of Micro, Small and Medium Enterprises, also presented their assistance to the stakeholders by their Department. In the last presentation, Dr. A. N. Roy elaborated the opportunities of Jute and other natural fibre related small scale trad to the start ups. He also tried to make a convergence among the startups and the facilitators. In the Vote of Thanks, Dr. L. K. Nayak, Principal Scientists, ToT Division, expressed his gratitude to all the participants including the Resource persons for their involvement to make success of the Programme.